On June 16th (Monday), starting at 10:00 we'll start the migration from our old servers in Budapest to a large datacenter in Amsterdam operated by Internap. Internap certainly has a track record in gaming hosting, so this will hopefully lower the on-terrain latency - Amsterdam is one of the major hubs of Transatlantic networking, so players from Europe and America should notice a much more stable connection. Internap also cooked up various solutions to continually adapt networks, so in short we're having high hopes for this. Now, a few words about the migration itself: During the period of moving, which we estimate to be around 3-4 hours (but you know how it is), all services will be down - game, web, email, IRC, everything. Some of this delay is inevitable (DNS propagation) and services will come back asynchronously: we'll try to get the game back up as fast as we can - most services are already running and working fine, we just need to synchronize some files and databases. It's probably your best bet to follow us on Twitter or Facebook to follow our migration progress. Over the course of the last few months, as I was reading forums and talking to people on IRC, I couldn't help but notice the staggering amount of suggestions and fairly simple requests that we've been offered. While this would be by default a fantastic thing, it triggers a returning problem that most players are blissfully unaware of: the complexity of our architecture, and our dedication to keep the architecture as robust as possible. What this essentially means is that sometimes the most trivial minuscule feature has to go through a rather arduous chain of procedures to be finally implemented on the client side. My attempt in this post today is to present you with a case study of how this happens in case of something most people would consider a single line of code and 20 seconds of work. But first, let's talk about concepts. The way we do it is manifold: For artists, who mostly work with standard format data (bitmaps, meshes, sound files), we have a file server where they can upload new versions of resources, and they get downloaded the next time someone starts the game. Of course this can result in some problems when we change some internal file formats, but as long as the client is able to do an update, this shouldn't be an issue. (We also have revision control, so reverting to an earlier version is easy.) On the other side, we have the content guys who work on managing the actual game logic data (i.e. item data, balancing, that sort of stuff) - this isn't as trivial because this data needs to run through both the server and the client: the server needs this data for calculating the game logic, the client needs this for displaying data and doing client-side prediction. This also needs to be both persistent and easily alterable, so for this, we need a strictly database-driven environment. 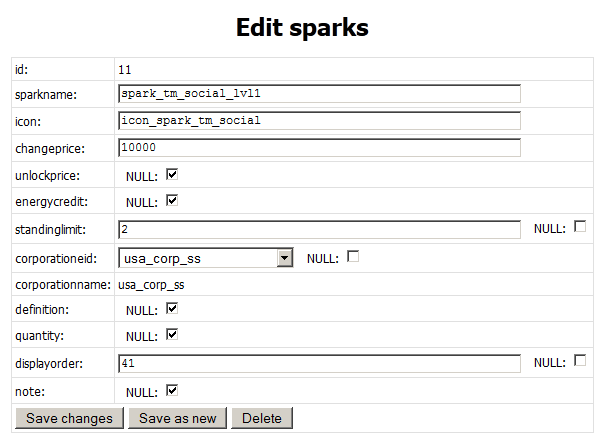 The most trivial example I already noted when we were working on it was related to sparks: The spark GUI was pretty much finished codewise, when Zoom noted that the order of the sparks doesn't make much sense because the syndicate ones are on the bottom while the ones that are harder to access are on the top. The reason for that, obviously, was that Alf simply added them in the order he felt like at the time, assuming that we can just sort it on the GUI-level later. He was obviously right about that, except we didn't really think of a method. We could leave them unsorted. That doesn't fly because it's annoying. We could sort them on the server, by hardcoding etc etc see above yeah no. 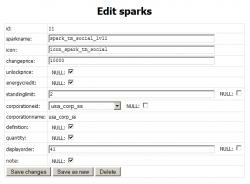 We could extend the database records for sparks with a sort order value. Shiny clean solution, but with the most work to be done. Why? See below. So here's the entire process of how a single integer value traverses through our infrastructure. As you may see these aren't particularly complicated steps by themselves, but the amount of steps and their versatility eventually amounts up into a surprising amount of time. 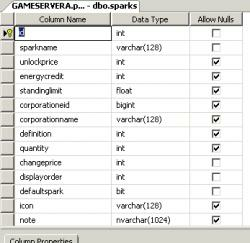 First, we take the database table for sparks, and add a field. This is done on the database server, usually by Crm. Second, we extend the administrative web-based back-end (what we lovingly christened "the MCP") with the field so that we can have data to work with. This can get tricky if the field isn't just a standard number (but e.g. a new item type or an extension ID), but in this case this is just a simple text field. This is done by me. Let's remind ourselves of something at this point: Because of our rather rigorous security-principles, no game-related data will be kept on client side, everything comes through the server. Now because sparks are very much a core gameplay element, everything related to them will also come through the server as well. So our next step is to add server code that loads the new value from the database, and hands it to the client. This is done by Crm again, and usually involves a server restart, much to the chagrin of whoever is working on the development server at the time. 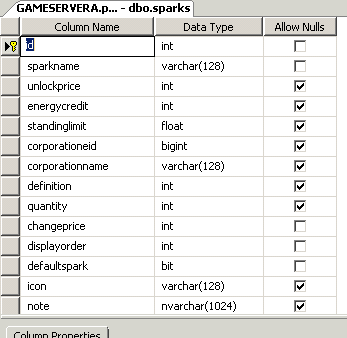 So now our value is en route to the client, all is left for me is to add fields to the client cache and use it to actually sort the sparks in the correct order, i.e. 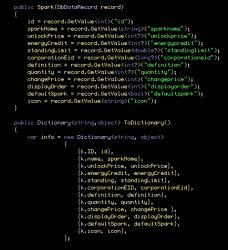 the aforementioned "single line of code". Of course, the actual sorting algorithm code is already there, I just have to build a new comparison function, test it, deploy it as the newest client update, and ultimately the feature is done easily. Simple enough, but if you look back, the ricochet performed by that one measly integer value is pretty staggering. It's completely "user"-driven, anyone can use the web-interface to change the values without having to worry about breaking something in the code level (mostly); database-constraints and form-validation can take care of values we don't want in there. 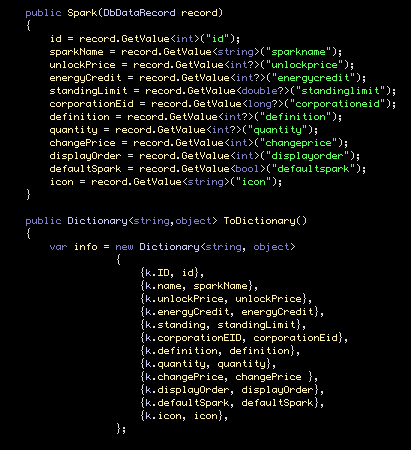 Most of the code-changes needed are just passing around values without thinking of what it really is. Once the code works, it'll always work as long as the data itself is solid. Now, to make sure that you understand the gravity of this stuff, here's a little thought-experiment for you: When you right-click an item and select "Information", there's a lot of parametric data that ends up on the screen, each with their specific measurement unit and number format. Now remind yourself that some of these values may look completely different internally: percentage values that show as 5% are obviously stored as 0.05, bonuses that show up as -25% may be stored as 0.75, some values need two decimal digits while others need five, and so on. In a later post, I will go into a deeper insight about how an actual feature (case in point the whole spark-doohickey) goes from an idea to design to concept to task to implementation, down to the level of "BUG #4170 - please move that text one pixel to the left". What is the task at hand, what are the conditions we can work under? We need to have a map in the game where players can see the main navigation points. The goal is the map to look as good as possible within the given circumstances, since players will be staring at it for prolonged periods, and we don't want them to stuff their own eyes into the recycling facility 5 minutes into the first transport mission. We do not have expendable artists who can spend time on painting maps manually, but more importantly, unlike other games, the map here needs to be as accurate as possible, for strategic reasons. Not really a mission-statement as such, but resolution-independence is a plus. 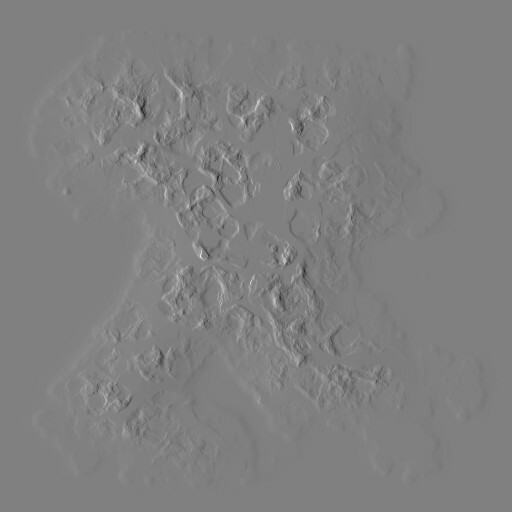 This is the actual terrain height-map, a 2048x2048 2D dataset of 16-bit height values. The reason it looks so dark is because this is a linear mapping of the 0..65535 range to the 32 bit colors available on your screen. Given that we don't really have to care about the peaks so much, since robots can rarely pass those, we can re-map the range of interest between two completely arbitrary values following "This Looks Good Enough"-principle, ideally somewhere around the water level for the low value, and the highest walkable point on the map for the high value. This already looks a lot more usable. Sure, the mountain peaks become a big white spot, but we don't have to concern ourselves with those because they're rare, usually uninteresting for the player, not to mention the strange yodeling sound they emit. This almost looks good enough and no-one would blame us if we'd stop here (no, you wouldn't, shut up), but we knew we could do something more interesting given the data at hand a little maths. 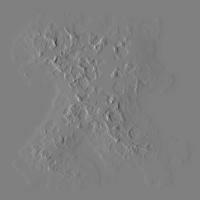 The image already has a nice faux-natural quality to it, but it needs contrast, the same way maps often have a little lighting / shading on them. At this point, the idea was to take the altitudes, more specifically the altitude-differences (or slopes), and turn them into shading. For this, what we've done is an implementation of what generally bitmap-manipulation software call as "Emboss", and basically means taking surrounding pixels, and calculating a normal vector out of them. Many of you might wonder if it means we're calculating a normal map, and in one sense yes, but the trick here is that the direction of the light can be fixed, because why not, it's Good Enough, and that allows us to speed up the calculations simply by assuming that the light always comes straight from the left. Not the prettiest of pictures, but it's a vital component towards what we want: contrast. 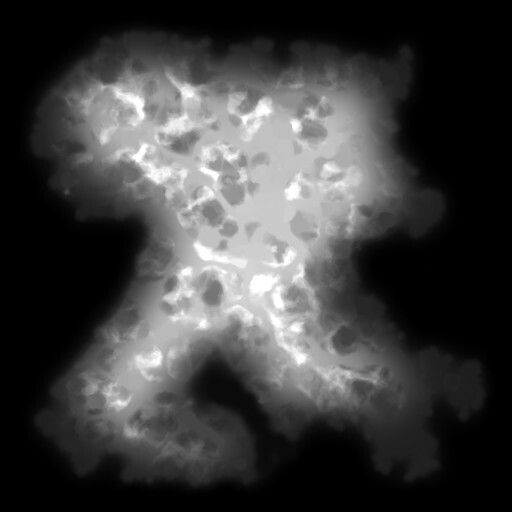 So we have a colorful picture with no contrast, and we have essentially a bump map with no colors - how do we blend the two without calculating lighting on every pixel? 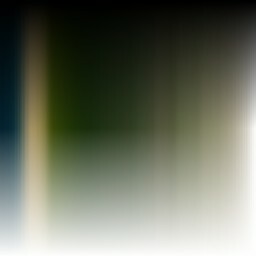 This lookup-table is ostensibly the above gradient, with the top half fading to black and the bottom half fading to white. Between that, in the very center, is our original gradient. 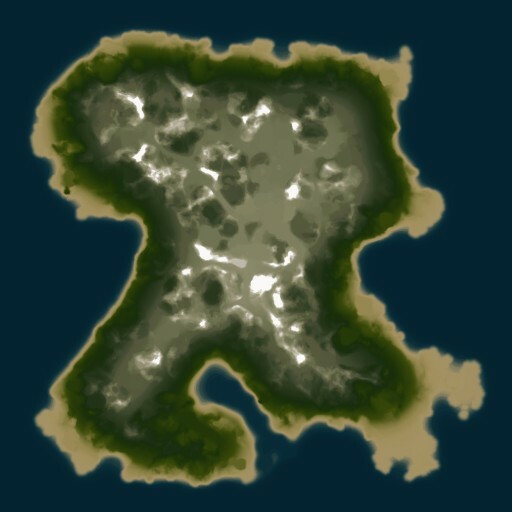 The difference is subtle, but definitely visible when the maps are zoomed up close - which is what will happen in most cases. That concludes our first visit to the forsaken wretched nadirs of the Perpetuum codebase. I'm not sure what to write about next time, but I suppose a quick look at the "number of changes per line of code" graph will quickly indicate where the "interesting" bits in our code are.